“Dark Alleys and Born Again Moments” from Christian Faith Publishing author Fred Bapp is a vibrant and authentic collection of poetic musings on pain, death, and life, soul-stirring writings that find their genesis toward the end of the ’90s, a few years after the poet’s first wife and soul mate, Judy, was diagnosed with a cancer that would take her life a few years later. “Dark Alleys and Born Again Moments”: a solemn book of poetry about pain and recovery. 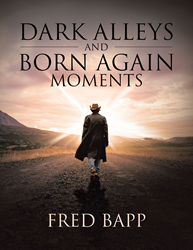 “Dark Alleys and Born Again Moments” is the creation of published author Fred Bapp, a clinical director and group psychotherapist who works with recovering addicts in a Christian setting, and who in his free time enjoys walking half-marathons. Published by Christian Faith Publishing, Fred Bapp’s new book is a deeply vulnerable book that offers the hard-won wisdom from the end of a painful journey toward recovery, just before the light hits. These gripping poems are written with the empathy and self-awareness of a psychotherapist and social worker who has not only worked long with people in recovery from addiction but has suffered tremendous loss himself. Bapp writes with alacrity in the prose-poem “Our Declaration of Peace”: “I am no longer going to try and control you by my words, by my actions or by my attitude. I am now aware that unwanted touch is violence and violates boundaries, yours and mine also. I do not want you to stay with me because you are afraid of me and what I might do. Neither do I want to stay with you from a sense of fear. If I become angry or upset with you for any reason, I will not verbally or physically hurt you nor will I allow you to harm me in those ways. I will temporarily leave you should I sense I am going to lose control of my words or behavior and I will allow you to leave me should you desire to do so. When I return, or when you return after an hour alone, we can talk about what happened if we both agree to do that. View a synopsis of “Dark Alleys and Born Again Moments” on YouTube. Consumers can purchase“Dark Alleys and Born Again Moments” at traditional brick & mortar bookstores, or online at Amazon.com, Apple iTunes store, or Barnes and Noble. For additional information or inquiries about “Dark Alleys and Born Again Moments”, contact the Christian Faith Publishing media department at 866-554-0919.